I am given a small glass. I down it and look around. A steep wooden stairway leads to the basement from which we can hear a well-known UPA song. Interestingly, archness, being ready with a joke on various occasions, and total absence of excesses is very often found in people who have seen and lived through a lot. “I realize that the times are changing and to make young people interested in history one needs other, newer approaches. Here we have a masterful, talented managerial approach. Are there any speculative aspects to it? Without a doubt, but are they permissible here? Please, understand that I am not saying absolutely not, I’m trying to analyze things. We are listening to music and sipping hot herbal tea with honey and hips, perhaps the kind UPA men brewed. There are many waiters hurrying hither and thither, all of them young people wearing loose khaki jeans and T-shirts with the UPA insignia: red and black stripes. Still, they look more like US volunteers. There is a steady flow of customers, among them noted Lviv journalists, actors, businessmen. There are many young visitors who come to order simple — but rather expensive — dishes and take pictures of each other in front of very large photos showing young people dressed in paramilitary uniforms, almost always in the woods and carrying weapons. Customers train their cameras on a portrait of Stepan Bandera, an old wireless or even a flatiron from that period. We sit in silence, listening to Russian being spoken around us, which is somehow out of place. Says York Newark, the author of the Kryivka project: “Don’t be surprised. We have many guests from Russia and the east of Ukraine. At first they very often tend to be aggressive, but they leave almost our friends. Our guests buy books about the UPA, they show an interest about its history and their general attitude to Ukrainian history changes. Is this bad? People can understand each other only when in close contact. Even several Russian TV channels visited us and their programs turned out quite acceptable, even pleasant. “By using the interior, music, the waiters’ costumes, and menu we created a living museum of UPA history. We want to prove to everybody that history should be treated easily instead of turning it into politics and capitalize on it. Our personnel even took a course in UPA history so they know it and what to tell our guests. 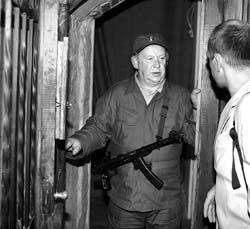 I know that Kryivka’s patrons receive numbered keys, so they don’t have to knock on the door with the formidable security guard. Key no. 1 was made for Lviv Mayor Andrii Sadovy. (This reminds me of Dubas’s yet another frashka: “I choose power not for the sake of paradise but to save people from hell on earth.” A month after launching the restaurant the mayor’s office received a letter from several nonprofit organizations requesting that Kryivka be closed because it is abusing and humiliating the national liberation idea. The organizers have a different concept. They want a chain of such restaurants all over Ukraine. They say that this project is most actively supported in the east of Ukraine. True, there are enough supporters in Lviv. We leave Kryivka and breath in the fresh air. There is a waiting line by the entrance. Something the residents have not seen for a long time, considering that there are so many restaurants, bars, cafes, and suchlike in the city and their owners are ready to cut each other’s throat over clientele. Maybe there is something we don’t understand, maybe the times have changed so much that anything can be used to make money? So a provocative idea can be used to rejuvenate the [national] idea? After all, jazz musicians have come to Baptist churches and restaurants open at history museums, although they are in some way separate from the rest of the premises. Once I heard an old NKVD man say, “Whatever they say, those young fellows did love Ukraine.” I wonder how they would feel about Kryivka. Maybe humorously, for they were young and cheerful. Or maybe they would feel sad, like Dubas.